Most guests had gathered in the RAC Committee Room to catch up with old friends and drink champagne until noon, when it was time for brunch. 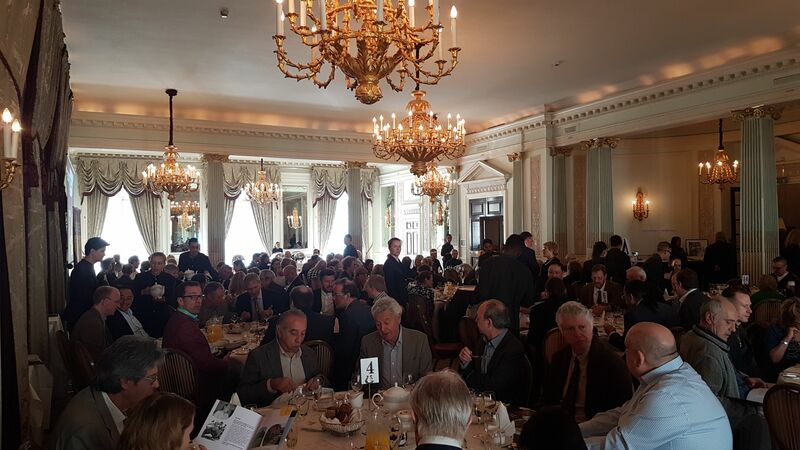 Close to 150 guests filled the Mountbatten Room for a memorable brunch with much merriment….and more champagne! Then the serious business of fundraising for Scope began. Brunch before Battle….it wasn’t really this dark! 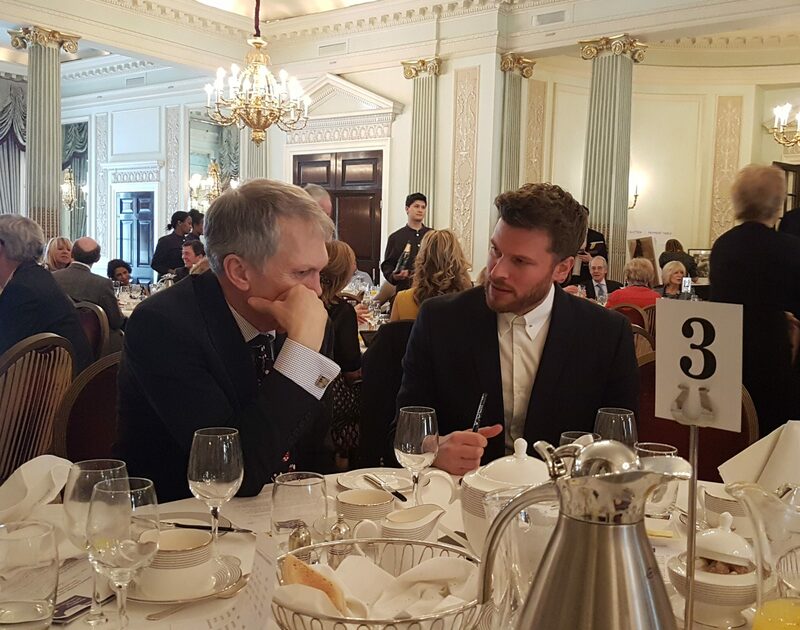 The writer and broadcaster (not to mention keen backgammon player) Rick Edwards was our host and auctioneer this year. 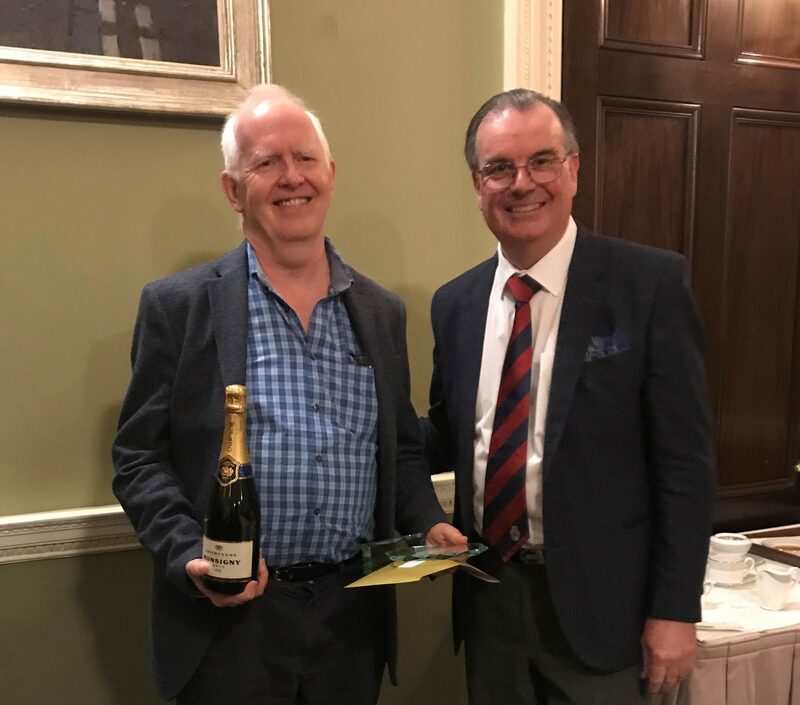 Rick claimed never to have conducted an auction before, but he was entertaining as well as successful in coaxing guests to dig deep and outbid each other for great prizes in both the live and silent auctions. Peter is stumped by a tough Match Equity question from Rick…. 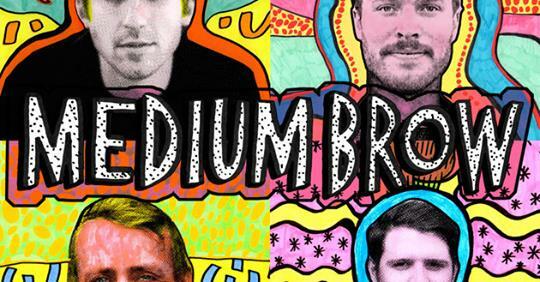 At this point I will digress for a moment to mention a podcast about backgammon in the ‘Medium Brow’ series presented by Rick Edwards and his friend George Lamb three years ago on Radio Wolfgang, and in which I was invited to participate. If you haven’t already heard it, it’s worth a listen – click here and select episode 94. Back to the serious stuff. 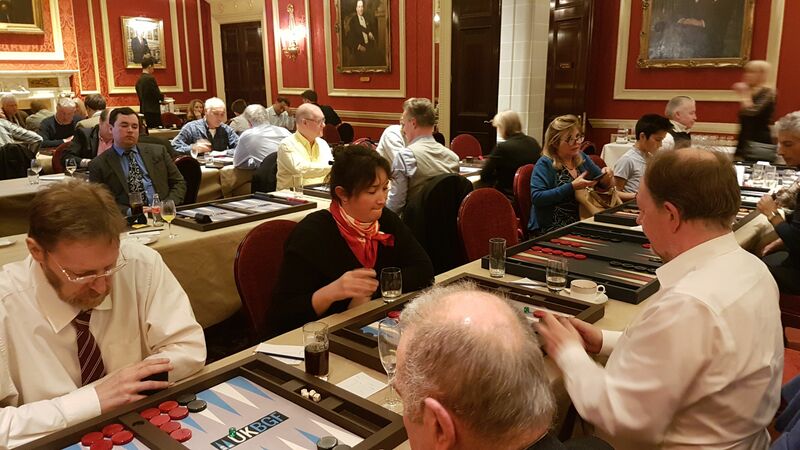 Live auction prizes ranged from a lesson and doubles partnership package courtesy of Backgammon Workshop, to a 10-person holiday in a beautiful Somerset cottage. Together with the silent auction, these items raised over £10,000 for Scope to add to tournament entry fees and other donations. Figures haven’t been finalised yet, but the total profit for Scope is expected to be over £25,000. The fundraising was followed by the Masters player auction. 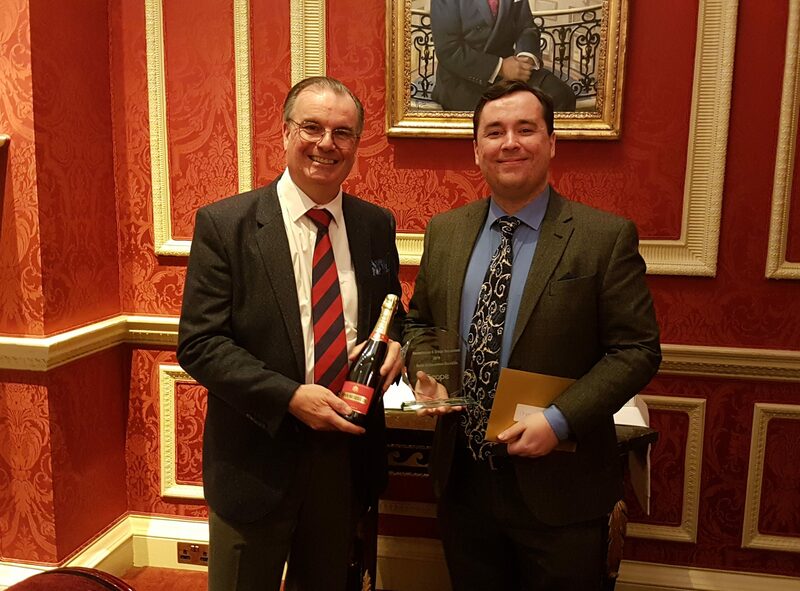 As last year this was a double act between Sean Williams and myself, and generated over £2k, with a 30% chunk of that heading Scope’s way. Rick Edwards played in the Swiss Championship, as did Mike Main (aka Mike Mad Monk), who was TD of this very event for a number of years. Left foreground – that player used to sit at the TD desk! The Masters tournament was a single knockout with non-progressive Consolation, and after frantic efforts over the previous 48 hours (including a couple of ‘upgrades’ from the Swiss Championship for Intermediate or Social players) we had a perfect 32 Masters draw. Soon after tea-time we were down to the semi-finalists. Rick Hirst, who had won the Swiss Championship last year, came frome 1-6 behind to beat me in a DMP thriller, 9-8, while Simon Morecroft overcame Lewis Potter in the other semi. It was getting quite late so the final was reduced from 11 to 9 points. Rick pulled ahead 8-5 Crawford and Simon looked odds on to win a doubled gammon to make for another DMP finish…that is until he was hit in the bear-off. Rick Hirst sealed the win and becomes the last Scope Masters Champion. Rick therefore wins ANOTHER Geoffrey Parker board! In the Swiss Championship, Connar Baird was the best performer, and his prize made the trip down from the Midlands worthwhile! Connar Baird looking particularly pleased after his Championship victory! So is this really the end? 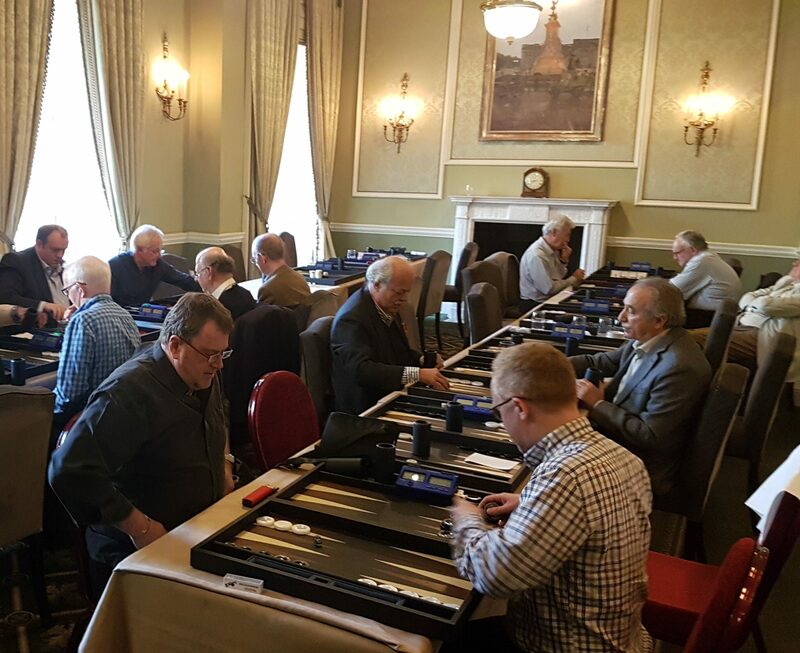 Well, it’s almost certainly the last time that Scope will be involved but it is just possible that the charity Backgammon and Bridge event might continue in support of a different charity and perhaps with a different format. Right now, I can’t say…. I remember this event well and I played in it a couple of times, without any success that I can recall, but I do remember once dining with two elderly multi-miilionaires (you know who you are), who both impressed upon me how much they prized their pensioner’s travel card! I also recall that the magician who had amazed us with his sleight of hand won top prize in the raffle, which is a neat trick! I miss UK bg, but not the weather, so greetings from Spain to all of you.